Phono MIC line . DJ PUB CLUB MIXER. 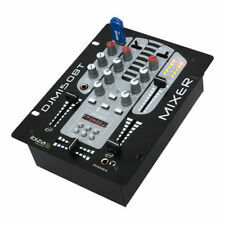 a very good and solid mixer with twin record deck inputs mic inputs and line inputs. The Numark DM1002MKII DJ mixer is an update of the classic DM1002 mixer. The mixer features line, phono and microphone inputs for an exceptional value in basic straight-ahead DJ mixing. For a 2-channel mixer, the DM1002MKII is very versatile with two line inputs, two switchable phono/line inputs, and one microphone input, as well as master and record outputs. Pioneer DJM 600 Professional DJ Mixer . Good condition with the odd little mark, works perfectly, no crackles, only reason for sale is a upgrade. Pioneer DJM 600 as described and pictured only. You are looking at a Numark DM3002X. Nice clean used example. Rane VP12 VOICE Processor . Condition is Used. Dispatched with eBay delivery – Shutl 1 day. Realistic stereo sound mixer SSM-2200. Echo: BBD system. Signal to noise ratio: 50dB (mic), 65dB (line), 60dB (phono). Boost / cut range: -12dB. 1 x Technics DMC SH-DJ1200 2 Channel Mixer. The DJ-Tech Handy Kutz is an ultra-portable DJ mixer in mini format. It has a line/phono input and an AUX-in mini jack on the front panel. Features DJ-Tech Handy Kutz. 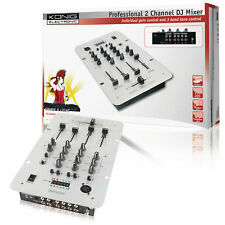 High performance 2-channel DJ scratch mixer. 6-channel stereo audio mixer, especially suitable for PA and DJ applications. Booth output -. Equalizer bass ±10 dB/100 Hz. Equalizer midrange ±10 dB/1 kHz. Pre-fader listening to each stereo input channel and the master output via adjustable stereo headphone output. KAM KMX200 DJ MIXER. THE KAM KMX-200 HAS BEEN DESIGNED AND BUILT TO GIVE THE SEMI PROFESSIONAL DJ MAXIMUM FLEXIBILITY, EASE OF USE AND HIGH SOUND QUALITY WHEN MIXING MULTIPLE SIGNAL SOURCES. THE UNIT HAS A TOTAL OF 5 INPUTS INCLUDING 1 MICROPHONE, 2 PHONO (TURNTABLES) AND 2 LINE (CD, TAPE, ETC). Inherited from the original innoFADER, it provides smooth and robust feeling to the Scratch DJs. The Reverse switch and Curve Adjust knob for crossfader allows you to do different style of scratch skill. A compact and portable little DJ Mixer. This sale is for the mixer only. No other parts or accessories are included in the sale. If you are in a remote area you may incur extra fees. The CORE MIX-4USB is a 4 channel DJ club mixer with 12 analogue inputs and 2 independent USB audio interfaces. It has an independent variable fx send for each channel which makes it possible to be creative with external effects. PHONIC DM3010 DJ MIXER. THE PHONIC DM3010 DJ MIXER IS A GREAT ADDITION TO ANY DJ KIT. RARE TO FIND IN THIS CONDITION. 3 DEDICATED LINE INPUTS. 3 WAY EQ ON EACH CHANNEL. 2 MIC INPUTS. 1 SELECTABLE LINE/PHONO INPUT. Amplifiers & Mixer. Mixer Cases. Master output with stereo LED level display. Adjustable headphone output with pre-fader listening to the stereo input channels and the master output. 4 stereo input channels, switchable 2 x line/phono, 1 x line/CD and 1 x line/USB (SD). The Ibiza Sound DJM200USB is a versatile 2-channel table top mixer featuring 5 inputs and USB input at a very affordable price. Amplifiers & Mixer. Mixer Cases. Headphones output with CUE monitor. Active Speakers. Party Mix From absolute beginner to seasoned DJ, the Party Mix can get anyone’s party started! Simply connect to your laptop to access your music library, install the included Virtual DJ LE software and start mixing all your favourite songs with ease. With pro features that allow you to mix, blend and add samples to your music, your playlist will be bringing down the house in no time! The built-in light show powered by the 3 LED Party Balls on the back of the unit bring a whole new level to your performance, and with 5 light modes including beat controlled, you can customize the party atmosphere even further. Technics SH-EX1200 Audio Mixer w/Power AC100V from Japan [Exc ] #11026A. Power AC100V​ Cable. Appearance of the item. It is totally in good condition. However, I will provide courteous and responsive service. Rare Boxed Vestax PMC 15 DJ Mixer 3 Channel Transformer Buttons Onboard Graphic Equaliser This is in amazing condition for its age. Check my other DJ equipment for sale. Mixer is in a good condition with a few small marks around the body as shown. Mixars Cut Mk2. It’s asolid mixer with2 channel switchable Phono/line inputs and anindependent MIC input with dedicated EQ. Why people choose Bop DJ. CUT is the definitiveBattle mixer. This is not a Mixer, it’s a Mini-Tank! Ultra compact, portable 2-channel DJ mixer from the creators of Raiden Fader. RPM-100 Portable Mixer was created to up your portable skratch and mix experience. The perfect hybrid mixer. a portable beast, highly capable and worthy also for studio indoor use! Item condition: • Used: V.G.C * required cleaning pots, buttons Includes: • P.S.U for U.K * all photos are from actual product, you will receive what you see in photos. Unit works on: ​​​​​​​ • AC~ 230-240V. Technics SH-EX1200 Audio Mixier [Exc-] #425248A. Optical system. I will look it for you. Including cable. Functional It works properly. The crossfader is a bit unstable. It is totally in good condition. Numark PPD01 24 Bit Digital Mixer Desk Disco Dj Hardly used!